A state legislator recently punished two South Carolina universities on supposedly moral (but apparently homophobic) grounds, cutting away from funding because each school includes books that mention homosexuality in reading assignments. "(The schools are) promoting gay and lesbian lifestyle," Rep. Garry Smith said. Advocacy group SONG (Southerners On New Ground) quickly responded, though, and with a clever and spirited website campaign that's quickly gaining ground. 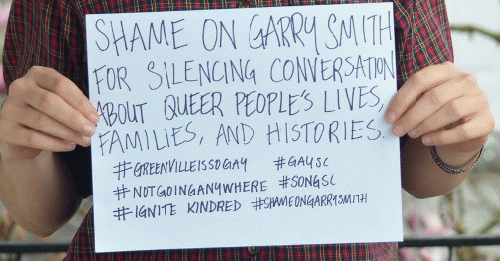 On a new Tumblr page, SONG is displaying photos of supporters -- gay, lesbian and straight -- university students and staff -- bearing messages to Smith. "This attack is clearly an effort to silence queer people's voices. In response, we have created a platform to amplify the voices of queer people and our allies in South Carolina. While the " legislature engenders hostility in our hometowns and schools, we seek to build community safety by becoming visible to each other as queer people and resisting the erasure of our stories. There must be nothing about us without us. Local or national, if the issue is about us, our voices must be heard."